dog days of summer – Hello Korea ! Yesterday we had a special dish for lunch, with one of the kitchen staff serving up large bowls of chicken soup. Y explained that it was the third hot day and signified the beginning of the hot season, so to commemorate, we are served hot soup. Now, it is also the season for dog soup and Young-a wants to take me to some next week. I told her I didn’t know how I felt about it, especially after reading up on it on the internet, (not just reading wikipedia or anything, but going to Korean animal rights organization sites) and that I really didn’t want to eat an animal we keep as friends. Of course, it IS kind of creepy if your best buddy ends up on someone’s dinner table. Even though we know the dogs being cooked in soup aren’t typically anyone’s pets, there’s always that unknown possibility of dog kidnapping and trafficking that makes one uncomfortable. I guess my feeling is I feel TERRIBLE when I’ve lived for a year without meat (I was lacto ovo vegetarian for many many years) and despite a pretty balanced diet and supplements, I never felt complete. But one time I slipped and the hit of pure animal protein suddenly filled me with energy and I felt alive for the first time in years. I think those canine teeth we have are there for a reason. But the bulk of our teeth are for vegetables, and that’s where we should get the bulk of our food. But how often do I truly need something like that? Maybe about four times a year? My thinking is YEAH. So go ahead and eat meat. But it shouldn’t be too often, and it shouldn’t be taken so for granted, and we should honor that animal and get down on our hands and knees and thank it for its life. 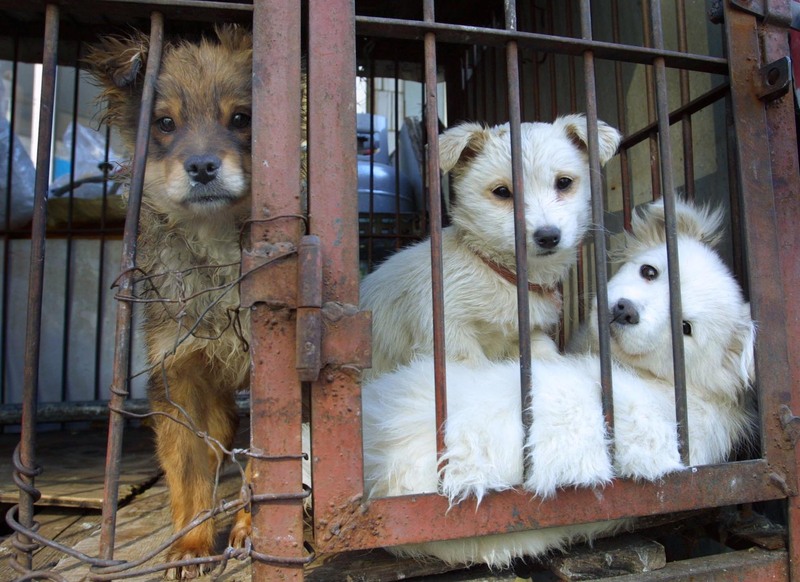 One of the more interesting things I found, which I will try to find for you, was an article which included the larger social implications of being a seller of dog meat in Korean society. This article kind of dovetails in with my recent thinking that Neo-Confuscianism is a lot like the Hindu caste system: your position in society at birth will largely dictate your position throughout your life here, and unless you are some rare beauty, even marriage will be denied as a class stepping stone. It seems the only way to rise above this fate is an exceptional intellect, heroism against enemies, and temporary celebrity. With the Neo-Confuscianism, class was strictly codified, and THE ONLY way to climb socially was through the civil service examination: thus, the centuries old tradition of the lower classes obcessing over exam competition. Today there is a culinary school in Seoul that gives classes on royal court food. In contrast, there are the offal eateries in the traditional market. I just wonder sometimes, if class doesn’t have something to do with taste and a culture’s food choices, and who we are to condemn what those at the bottom have been forced to eat in the past, to the point where it is now thought of fondly as part of their culture. I mean, this is a place where “how are you doing?” literally means, “have you eaten?” It was very, very rough here for a long time….As for me, I don’t plan to eat my companion pets, and I really don’t think this is a food source that is going to grow in popularity any time soon. And now, with the huge popularity of dogs as house pets here, all it really takes is a photo like the one below, of obvious pets who’ve been captured for the dinner table, to get Koreans to think twice about this long held meat source. Anyway, if my school is any indication, I think the majority of Koreans aren’t going to seek out this dish in the future, and the dog meat traders will have to find some other line of work. Like many practices of the past, this too will probably fade away. The first time I saw people eating a dog, it was in the countryside. The woman who gave us a free house to live in decided to kill her old dog. So, it means they ate their friend. I was completly disgusted by the idea of eating a dog, so I refused to eat, and I grimaced in disgust when I saw my father eating the tail. But now when I think of my poor dad who had to fast many days due to the poverty, I’m glad the culture allowed him to eat well for once. I ate dog when I was at St. Paul’s orphanage, and it was delicious. The old age of the dog was again the reason why they decided to kill it. At the countryside, it was also the first time for many kids, and at the orphanage, I was the only one who had heard about eating dog before. Both of the time, kids and adults said strange things about eating dogs, so I wonder how Korean it was if it was Korean culture. Eating dog meat is not only a Korean thing, but something done all over Asia, and its health benefits are also spread all over Asia. So I’m guessing Koreans after WWII have always known it was an eating option should times get really lean. But I have also seen very old Korean artwork and read personal historical accounts of dogs being man’s best friend, and of people hiding their dogs indoors during summer, for fear they would be kidnapped by meat traders. So, there is very little need for dog catchers here…and the animal shelters are full of rescue stories by concerned citizens managing to thwart dog collection by dog meat traders. I betcha those meat traders spread the rumors of its health benefits – and especially the male virility part – to keep their profession alive. That profession, as the article cited states, is considered the lowliest of the low. Oh yeah, almost forgot – I guess there is a bill before the National Assembly to change the status of dogs to livestock, (will add link to information here) in order to regulate the sale of dog meat. I think the animal rights activists are against this, as they want the eating of dog meat totally outlawed. I have not studied the language of the bill, and if it will permit animal cruelty or not, or how they separate livestock from companion pets. I also have not aligned myself on any position regarding livestock, as I never was a vegetarian due to having a problem with eating animals, or even for health purposes: it was a more holistic reason, because I think the huge consumption of animals is a drain on the earth’s resources. After reading about the fear of dogs being kidnapped by meat traders, it made me think of something that happenend in my early childhood. Our neighbour’s dog had be caugth by a man. The owner of the dog saw it only after the dog was put in a large bag, and the man didn’t want to release it. I don’t remember what happened next, except that all neighbours were around them. Although I don’t know the true reason why the dog was captured, it seemed familiar to me and I’m sure it didn’t have rabies, it was a kind dog.